Alpha-1 antitrypsin (AAT) deficiency is a condition in which the body does not make enough of AAT, a protein that protects the lungs and liver from damage. 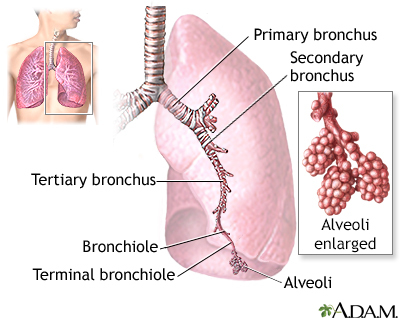 The condition can lead to COPD and liver disease (cirrhosis). AAT is a type of protein called a protease inhibitor. AAT is made in the liver and it works to protect the lungs and liver. AAT deficiency means there is not enough of this protein in the body. It is caused by a genetic defect. The condition is most common among Europeans and North Americans of European descent. Adults with severe AAT deficiency will develop emphysema, often before 40 years of age. Smoking can increase the risk of emphysema. Treatment for AAT deficiency involves replacing the missing AAT protein. The protein is given through a vein each week or every 4 weeks. This is only slightly effective at preventing more lung damage in people without end-stage disease. This procedure is called augmentation therapy. If you smoke, you need to quit. Other treatments are also used for COPD and cirrhosis. 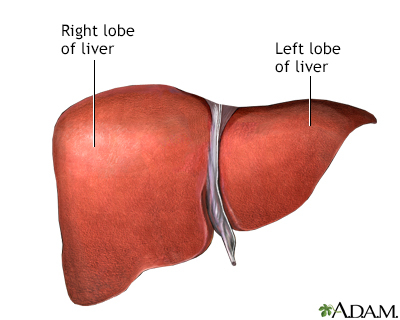 Some people with this deficiency will not develop liver or lung disease. COPD and cirrhosis can be life threatening. Call your provider if you develop symptoms of AAT deficiency. Hatipoglu U, Stoller JK. a1-antitrypsin deficiency. Clin Chest Med. 2016;37(3):487-504. PMID: 27514595 www.ncbi.nlm.nih.gov/pubmed/27514595. Winnie GB, Boas SR. a1-antitrypsin deficiency and emphysema. In: Kliegman RM, Stanton BF, St. Geme JW, Schor NF, eds. Nelson Textbook of Pediatrics. 20th ed. Philadelphia, PA: Elsevier; 2016:chap 393.